through my hands: Honey Would You? Why Yes, I would love to! Honey Would You? Why Yes, I would love to! You may have noticed from my previous post. My husband and I love to cook together. 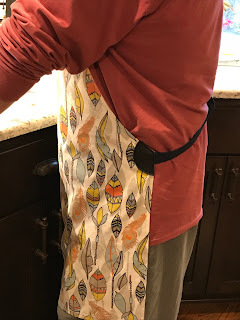 After our bivalve class, he mentioned that he would really like his own apron. 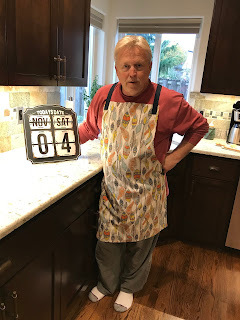 Our grandparents were smart and wore an apron anytime during cooking and sometimes cleaning to keep clothes clean and extend the life of garments. I think my generation got away from wearing aprons once clothing became inexpensive; therefore making them easier to replace. Tracy had specific requirements for the top area and placement of how he would like it to fit. I used some newspaper print and started drafting a pattern based on his requests. I got a little carried away and added some features that I thought he would like and that would make it easy to use. It was a fun project. This would be a great project for anyone because you really can't mess up an apron. Here are some other pictures of the sides and back. No ties! 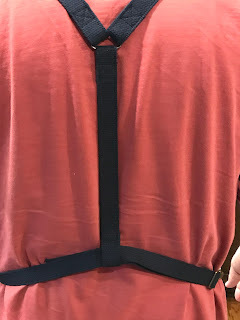 This setup keeps the apron just where you want it. For this application, you need to pin fit it to your person or add a button and buttonholes so that it is adjustable if you are making it as a surprise gift. Side clip with adjustable strap. Although, once you set it, you really never have to adjust it again. To remove, simply unclip and slip off. He can do it in one easy step. Other side has the strap sewn in. The dark material on the edge you see is a vinyl material I added that looks just like leather. 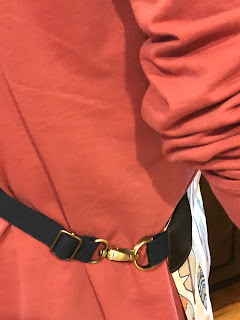 It covers up each side of the strap, gives a nice masculine look, and made the areas sturdy. Try making yourself a custom apron based on what you like. Wouldn't this be a nice tradition to start up again with family members! That's a great apron and it looks great on him. Thanks for sharing! Such a stylish apron! I'm sure the cooking will happen more often now that he has his own apron! I like all the hardware. Great design!